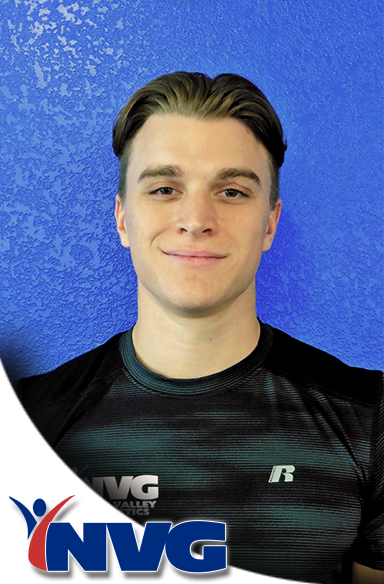 Dillon Zrike started training gymnastics late at the age of 15 but he quickly realized it was the right sport for him. At 16 Dillon started coaching recreational classes at his gym to help his parents pay for his training. He coached there for the next 5 years working his way up to coach boys team. Due to school Dillon was forced to give up his coaching job but soon found work personal training at a physical therapy studio. He learned as much as he could from the lead physical therapist in order to one day apply it to coaching gymnastics. At 22 Dillon decided to join the Navy and attempt to go through the BUDs pipeline to become a Navy SEAL. While trying to earn his BUDs contract Dillon came to North Valley Gymnastics and coached boys team with Travis Rainer. He coached at NVG for a season before earning his contract and going to BUDs. Dillon didn’t make it through BUDs but he completed 4 years in the Navy and has come back to NVG where he is now the Boys Optional Director.